Bulgari presents a 2016 preview of new watch models entirely in tune with its creative universe. The Rome-based jeweller innovates constantly by associating its mastery of precious materials with Swiss watchmaking precision. The new spectacularly flamboyant Serpenti Incantati watch once again highlights the iconic serpent theme in an astonishing way. Bulgari has long since tamed this symbolic and fascinating creature. Incantati means “enchanting” in Italian and Bulgari charms the snake in a whole new way through this spellbinding horological interpretation of Haute Joaillerie. It is also accompanied by an all-new precious dial for the Serpenti line, along with new versions on the Tubogas bracelet. 2016 also sees the introduction of additional new ladies’ watch references, starting with the Diva watch that makes a perfect match with the Haute Joaillerie and jewellery lines bearing the same name. Its sleek, elegant design conceals an unprecedented technical feat in the articulation between the watch and its bracelet. The shaped fan motif – inspired by ancient Rome and on which the jewellery collection has built its success – now adorns the 30 mm dial of two new precious versions. Bulgari once again successfully blends Swiss watchmaking and Italian jewellery in a ‘grand evening dress’ model, also available in a second version with an acetate dial. The fan securing the wristband is its unmistakable signature. In addition, Bulgari treats active women to a very appealing new model with the Piccola Lucea. This new version of its successful Lucea watch has been redesigned in a daintier diameter. It thus meets the growing demand for smaller ladies’ watches, making it a model designed for daily wear but which can also be worn as a piece of jewellery in the evening, like all Bulgari creations. Bulgari naturally does not neglect men and is exploring new watchmaking territories. The Octo watch thus appears this year in a highly contemporary black-clad version. This approach further accentuates its power and its singularity, forcefully affirming the personality of this watch featuring a unique and remarkable design. These new models naturally chime with the Italian culture pervading the brand, an identity continually reinforced by the array of exceptional Haute Horlogerie and Haute Joaillerie skills perfectly mastered by Bulgari for more than 130 years. Inventiveness and boldness thus join forces in shaping a refined vision of watchmaking. The Bulgari jeweller is a snake charmer. The precious new Serpenti Incantati watch entirely renews this theme through a modern design and a radiant Haute Joaillerie interpretation. Serpenti Incantati is an enchanting reptile, a snake so beautiful that it is never fearsome. It traditionally belongs to the bestiary of Ancient Rome and has long since been successfully tamed by the Roman jeweller Bulgari. In finding its way into the watch collections of the Italian Maison, it has become a watch by concealing a secret dial and a high-precision Swiss movement inside the serpent’s head. The snake now appears a new guise by taking on the shape of a round watch case. This new horological creation is extremely original. For the very first time, the reptile coils around the watch dial. Each part of the head and body of the snake has been entirely rethought and redesigned with extremely contemporary lines. “They are very soft and stylised. While Bulgari domesticates the snake, the latter nonetheless appears to be in perpetual motion. Therein lies the secret of this watch,” notes designer Fabrizio Buonamassa Stigliani. 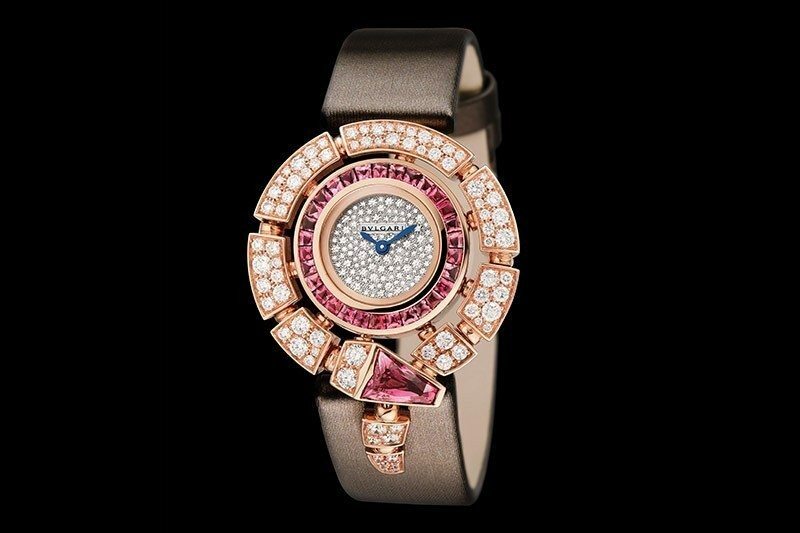 Four choices are possible, since the Serpenti Incantati watch comes in a rubellite or diamond version, each expressed through two different interpretations. The primary source of inspiration for this jewellery watch was a vintage brooch crafted in the 1930s Bulgari Haute Joaillerie ateliers. In revisiting this jewellery creation, the Roman Maison testifies to the strength for the future represented by its incredibly rich heritage. Bulgari is also presenting two other jewellery watches on the Serpenti theme this year, both in limited editions. The double wrap-around bracelet and the head are set with diamonds, while emerald or ruby eyes give the entrancing serpent a deeply disturbing gaze. The colours of these models are created by intense lacquers: one of the versions plays with the sombre magic of black, while the other one coils a deep emerald green around the entire bracelet, in contrast with the glittering ruby red eyes. These two beautiful contemporary tributes to historical models also testify to this motif’s enduring ability for self-renewal, thanks to the permanent and inspired creativity nurtured by Bulgari. At over 60 years’ old, this snake is more modern than ever. Alongside the snake theme, Bulgari is also reinterpreting another of its symbols: the Tubogas bracelet. Two executions of the Tubogas bracelet are offered: one has the radiant gleam of polished steel, a material that exalts the architectural and technical nature of the articulated bracelet. The other plays on the combination of shimmering chrome and gold reflections, demonstrating Bulgari’s characteristic mastery of matter in general and of metals in particular. Thus named in reference to the modernistic, industrial aesthetic of the flexible piping featured in sports car exhaust manifolds during the Art Deco period, the first supple Bulgari jewellery models appeared in 1932. The jeweller soon afterwards also created a distinctively styled watch collection unique in its kind. The bracelet sensuously wrapping itself twice around the wrist is the key asset of the new timepieces. It testifies to a specific Bulgari technical skill that consists in assembling gold or steel ribbon-like strips with clean-cut rounded contours around a core spring, without any soldering. In 1962, when filming scenes for Cleopatra, Elizabeth Taylor had to be careful to remove her favourite gold watch with its diamond-paved snake’s head and tail. This was of course to avoid any anachronisms, since the Queen of Egypt was not yet acquainted with the pleasure of reading the time on her wrist. Ever since, popular enthusiasm has remained intact for this unique watch. Unique, but never uniform, since Bulgari regularly renews the interpretation of these watches that are one of its creative signatures. In direct line from its Haute Joaillerie or contemporary Italian jewellery collections, Bulgari presents Diva, its new precious watch model that pays tribute to feminine beauty by accentuating it with distinctive character. The sensual and romantic Diva naturally evokes the delightful hours of Rome’s Dolce Vita, that gentle touch of mischievous nonchalance counter-balancing perfectly cultivated elegance. Heir to the jewellery expertise of the Rome-based Maison, Diva appropriates all its design codes to become a sophisticated timepiece for active and refined women. It also morphs into a jewellery watch for evening wear. Diva draws part of its inspiration from the enduring charm of Roman beauty – and in particular from a remarkable motif from the mosaics adorning the Caracalla thermal baths. A motif reinterpreted in an extremely modern manner and which has become a symbol of Bulgari. This softly geometrical pattern is now associated with the round case of a watch, forming natural, smooth lines that accentuate the design of the case, as well as ensuring the smooth integration of the satin strap by means of a surprising secret articulation system. This technically very complex mechanism – perfectly executed thanks to the skills of the artisans exercising their art in Bulgari’s Haute Joaillerie workshops in Rome – endows the watch with unexpected suppleness. This flowing feel ensures perfect comfort on the wrist, where it reveals the full strength of its design – not only as an expression of creative prowess, but also as an aesthetic element serving to enhance the perception of the watch by the woman who wears it. For Bulgari, no element is ever fully and exclusively dedicated to performance alone. Nor is it designed to be purely decorative. Beauty stems precisely from the balance between two creative forces: technicality and beauty. True elegance lies in concealing any hint of such complexity – even though the woman wearing the Diva on her wrist will immediately realise the truth. Bulgari has succeeded in creating a feminine and in fact highly complex watch on the basis of apparently very simple shapes. With Diva, Bulgari is also surprising and innovating in terms of watch design by making the astonishing choice of a natural acetate dial. Bulgari thus dares to introduce a high-tech material born from the fusion of wood and cotton fibres. Acetate is an organic material that can be polished to create unique and specific light effects that prolong the warm glow of the white gold case. Acetate is a visually simple and natural material that is also highly malleable and makes a perfect match with the diamond hours and minutes markers. This jewellery touch echoes the tourmaline cabochon adorning the crown, and in an ultimate touch of refinement, Diva also comes in a white gold version with a fully paved diamond dial. The Lucea watch now doubles its seductive powers, as Bulgari has chosen to reinterpret it in a slimmer and daintier size that enriches this highly successful range. The new case measures 23 mm, teamed as ever with its highly inventive bracelet. This baby sister clearly lives up to the reputation of its luminous family, since Piccola Lucea is first and foremost a tribute to light. This 21st century sundial reflects the culture of Ancient Rome to exalt the measurement of time on a woman’s wrist with a blend of beauty and sensuality, ease and facility. These important principles remain at the very core of Bulgari design. A watchmaking echo of the jewellery collections from the Roman Maison, Piccola Lucea benefits from Bulgari’s perfectly mastered skill in working with precious metals, notably inherited from the famous Serpenti bracelets with their sensual, flowing design. With Lucea, the art of the watch bracelet finds a new form of expression, notably thanks to the extremely ingenious link fastening and articulation system. One of the most important challenges lay in overcoming the permanent tension between suppleness and rigidity by striking the perfect balance between these two qualities. The aim was that the bracelet composed of highly technical links should ensure a firm hold for the watch as well as absolute comfort on the wrist. Lucea is not a jewel that tells the time, but instead a watch that women love to wear on all occasions throughout their active days, while also keeping it on for festive occasions. This joyful and delightful dimension is underscored by the pink gold cabochon that lends a sparkling touch to the crown and further enhances the shimmering glow of the round case. The change of size implies a certain restraint in terms of the dial, so as to ensure that its purity and controlled light effects safeguard perfect readability of the time in every circumstance. In parallel, the most significant creative effort has been devoted to the design of the watch itself. Bulgari has taken great pleasure in taming the play of light and shade over the case, dial, bracelet lugs, as well as the way in which it glints off the links. It is precisely the contrasts between shadows and light that can deepen or raise shapes, as designer Fabrizio Buonamassa Stigliani points out. Finding the right paths of light is a fascinating task. Born of a passion for light and for time, the Lucea watch is dedicated to amorous seduction. Its magnetic charm is intensified by its new, universally graceful size that can be appreciated the world over. For Bulgari, faced with increasingly strong demand for small-diameter watches, it was entirely logical to create a timpiece that was not merely a downsized version of an existing one. Piccola Lucea is an all-new model. The complete rethink and redesign process involved every line and every component. It thus adapts in an unmistakably modern way to women around the world, meeting classic and traditional aspirations, as well as the contemporary desires of elegant, active urban women. With a smaller-sized watch, today’s woman demonstrates her attachment to the horological heritage of yesteryear, as well as her desire to make her watch a contemporary style element – because the Piccola Lucea watch is one of her weapons of seduction just like her jewellery. The virile elegance of black has asserted its pure power as an integral part of modern style. Italian designers were pioneers in this domain. More inspired than ever by the creative strength of Italian design, the iconic Octo watch with its unique, strongly structured case is now reinvented in a highly contemporary and opulent black exterior daring to flaunt an unexpected association of materials. Bulgari associates a black D.L.C. coating with pink gold in a highly diverse range of variations and possibilities. Devotees of fine contemporary watchmaking are thus offered an innovative and surprising model immediately asserting a flair for differentiation and distinctive character. As Guido Terreni, Managing Director of the Bulgari Watch Division, points out: “Ultranero lends even more strength and contemporary power to the Octo watch. Its impact both visually and on the imagination is both immediate and striking.” While the Octo Ultranero is sporty by nature, it was not created for performance alone nor exclusively for efficiency. “Beauty is as important as strength, so it allows itself a touch of gold, because gold is the signature of luxury according to Bulgari”. Thus arrayed in a black D.L.C. coating, the 110-facetted, structured case of the Octo watch is endowed with additional strength that is every inch Italian. It immediately conjures up certain creations in the field of architecture or contemporary furniture. Its highly technical and masculine side evokes Italian sports cars, or certain large modern yachts. It even carries a hint of stealth aircraft, as if to endow it with an additional touch of mystery and secrecy. A whole new field of expression thus opens up for this watch that is equally at ease with urban elegance as in life’s more fast-paced moments. The Octo case is an extension of the Italian temperament. It is complex, yet it seems very simple. It is geometrical, but there is nothing rigid about it. It is elegant and yet consistently maintains a certain relaxed air that infuses life with a unique flavour. Black lends a very powerful aura to the models in the Octo Ultranero range. This watch doesn’t just play the urbanite in sports gear. It is instead a complete reinterpretation –through the creativity of its design – of a men’s timepiece epitomising the Bulgari style. The radical effectiveness of black is enhanced by the precious touch of pink gold, once again testifying to the two-fold watch and jewellery expertise of the Maison. Depending on the version, clients can choose between an all-black watch in D.L.C.-coated steel fitted with a black rubber strap and subtly lit up only by pink gold hands and hour-markers, thus embodying the boldness of restraint; or the equally bold option of combining a black D.L.C.-coated case with a pink gold bezel. Clearly cut out for excellence, this exceptional watch is powered by calibres from the Bulgari watch Manufacture established in Switzerland. Such a noble watch deserved an equally aristocratic interior: Octo Ultranero is presented right from its introduction with the world’s thinnest mechanical tourbillon movement, the Bulgari BVL 268 Finissimo calibre. The latter set a record at the time of its launch in 2014 that has remained unbroken ever since. The case of the Octo Ultranero Finissimo Tourbillon is made of black D.L.C.-coated titanium. The fabulous mechanical heart of the watch is revealed in its carriage visible at 6 o’clock on the black dial, whose very sobriety exalts the horological feat with exceptional elegance. This technical opulence is accentuated by pink gold elements in the finishing of the flying tourbillon measuring a mere 1.95 mm thick.